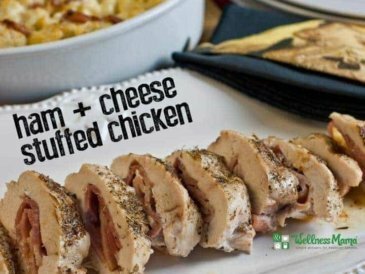 We all can get tired of preparing the same old foods night after night, and sometimes nothing is better than getting a little fancy and mixing it up! 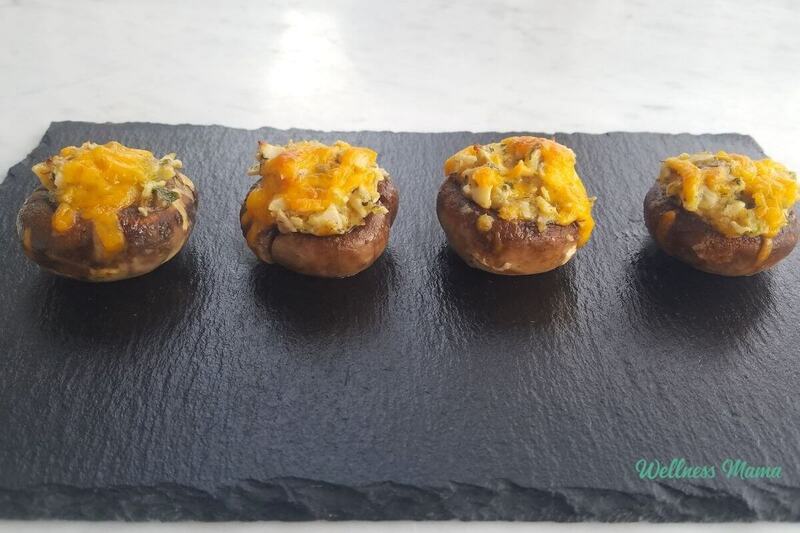 These crab-stuffed mushrooms are delicious and fun to eat, and contain enough fiber and protein that they could round out a complete meal when served with salad, veggies, or other small plates. The first step to making any stuffed mushroom is to choose the mushrooms. You can use just about any type of whole fresh mushroom you like. For this recipe I used about a pound and a half of white mushrooms that were about 2 inches in diameter. They held a nice amount of stuffing, were easy to handle, and could be eaten in about three bites. First, I drizzled the de-stemmed mushrooms with melted butter and placed them in a baking dish. To make the stuffing I used pre-cooked crabmeat. I order all my seafood online from Vital Choice. They have a great selection of wild caught, sustainably harvested fish and shellfish. 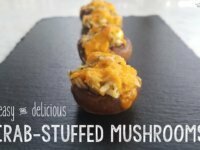 I heated the crabmeat with green onions, cream cheese, egg, and spices in a skillet and stuffed the mushrooms with the mixture before topping each one with shredded cheddar cheese. Then I added a little white wine to the baking dish and cooked them in the oven until the mushrooms were cooked and the cheese melted. We served them at a dinner party and they were a hit! These savory and filling crab-stuffed mushrooms make a great appetizer or part of a complete meal. Place the mushrooms in a large baking dish or on a rimmed baking sheet and drizzle with the butter. Stir to evenly coat and arrange so they all have the open side facing up. In a medium size skillet, heat the olive oil over medium heat. Chop the green onion and crab meat and add it to the skillet. Stir in the almond flour, onion powder, and parsley and cook and stir until just warmed. Add half of the shredded cheese, the cream cheese, egg, lemon juice, and dill and mix to combine. Fill the mushroom caps with the crab mixture and place so that they are just touching. Sprinkle with the remaining cheese and pour the wine into the bottom of the dish. Bake for 15 minutes until mushrooms are browned and cheese is bubbly. Feel free to use whatever kind and size of fresh mushrooms you like. I used white mushrooms that were about 2 inches in diameter and this recipe made enough stuffing to fill 30 of them. If this recipe has you feeling inspired, I have several recipes for stuffed squashes, peppers, tomatoes, and more! This is a great way to work veggies into an appetizer or tapas-style dinner. The heartier ones, like stuffed winter squash are a complete meal by themselves. 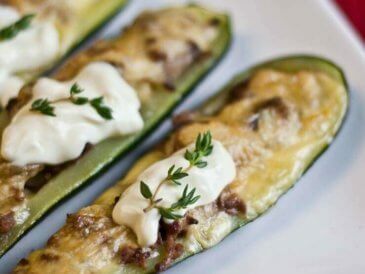 Sausage-stuffed Zucchini – Stuffed with sausage and bell pepper, this is a great on-the-go meal. 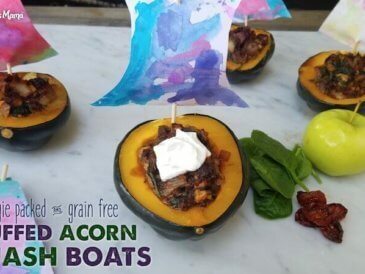 Acorn Squash Boats – Halved acorn squash boats filled with ground beef, onion, apples, mushrooms, and spinach and decorated with a kid-made sail. 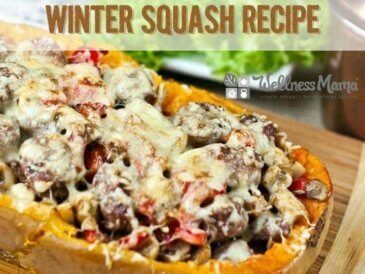 Stuffed Winter Squash – Choose any winter squash you like and stuff it with a sausage, pepper, and cheese mixture. Stuffed Sweet Potatoes – People stuff regular potatoes all the time, so why not sweet potatoes? 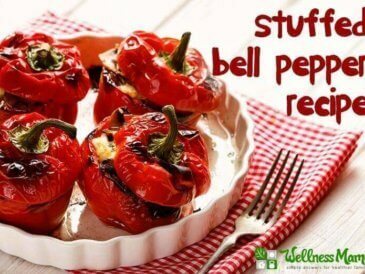 Philly Cheesesteak Stuffed Peppers – Real cheese and chopped steak stuffed inside a bell pepper. Healthy Stuffed Peppers – Make a grain-free stuffing mixture of ground beef, zucchini, and tomatoes. 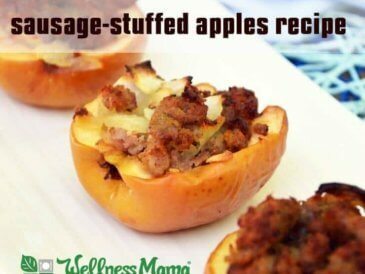 Sausage-stuffed Apples – I know, apples are actually a vegetable, but they’re great for stuffing and so tasty! Cherry Tomato BLT Bites – This Mommypotamus recipe is a tasty little appetizer with bacon, spinach, and cream cheese stuffed inside cherry tomatoes! Chorizo-stuffed peppers – If you like spicy, this is for you! Have you ever made stuffed mushrooms? What do you like to stuff them with?